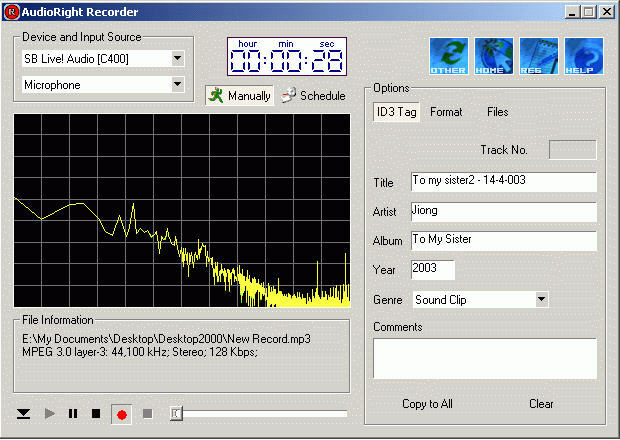 AudioRight Recorder is a sound recording and playing program. It records analog sound digitized by a sound card, as well as sound generated, or requested, by other computer programs, such as RealPlayer, Windows Media Player, Quick Time, WinAmp, and many others. Recorded sound is saved in WAV, MP3, WMA or OGG Vorbis format. Record sound to mp3, wma, wav or ogg format. ID3 tag support, ID3 Tag editable.